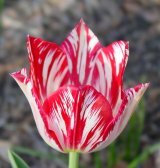 Almost any tulip in any tulip division has the potential to break, wherein the pigment color separates, revealing the base color in often beautiful color patterns. 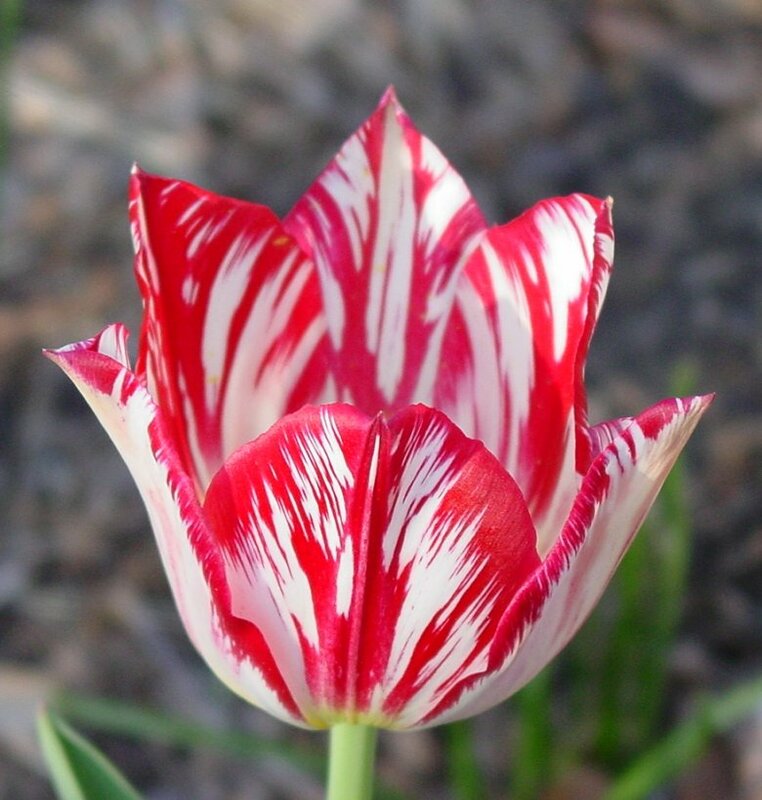 In the 1920s it was determined that these color breaks were caused by a tulip breaking virus (TBV) spread by aphids. Among the most treasured broken tulips are Single Late English Florists' tulips (EFT). The English Florists' tulips were and still are characterized by the half-ball shape and rounded petals. Many broken Dutch varieties have longer flowers and pointed petals (see the pointed petals of Silver Standard). The rounded tulip sepals of English Florists' tulips are a refinement from many generations of selective breeding. The Rose Juno tulip exemplifies the high standards set by the English Florists and their ultimate objective -- to produce the perfect flower. The pointed petals of many older Dutch tulips show the early closeness to the original wild parents. For much more on Broken Tulips, please see About Broken Tulips and other links in the menu (at left). This initial inventory has been compiled from several sources, including the following. Additional broken tulips that still grow today will be added to this list when they are identified. HB = Hortus Bulborum (default authority on non-EFTs). Tulips with this designation are in the collection of Hortus Bulborum. See the Breeders section of this website for additional details on breeders. The names in bold below are tulips currently being grown by Hortus Tulipus. We would greatly appreciate gifts of bulbs for other tulip cultivars not now in our collection. Also, we would appreciate any information you can provide on any of these (and other) old and rare tulips. Please help us make this list more comprehensive. Please Contact Us. Absalom, 1780 (HB) Note: Hortus Bulborum and other contemporary sources call this tulip 'Absalon', but "Report 1914-15" (see below) names it 'Absalom'. Broken Dutch Florists� Tulip. Bizarre. "Large, egg-shaped; rosy; tinged yellow; base yellow; 30 inches; May 10, 16 days." -- Report, 1914-15 / Broken Dutch Florists� Tulips. Image Index: Tulip Gallery. Adonis, about 1850 (WNE) <1915 (HB) 1914 (RL) Broken English Florists� Tulip. Bybloemen. (Bred by Headley.) "Broken only (feather, few flame), early." -- WNE. "Well marked with deep purple on a white ground, a little lacking in brilliancy; good constitution, increases freely; 26 inches; May 10, 15 days." -- Report, 1914-15 / Broken English Florists� Tulips. Albert Tear, about 1960 (Byb) broken (feather, poor flame) and breeder (WNE) See also under Breeder Tulips. Annie McGregor, about 1860 (WNE) Broken English Florists� Tulip. Rose. (Bred by Martin.) "Both Broken (feather and flame) and Breeder" -- WNE. "Beautifully marked with scarlet on a clear white ground; generally flamed but occasionally feathered. 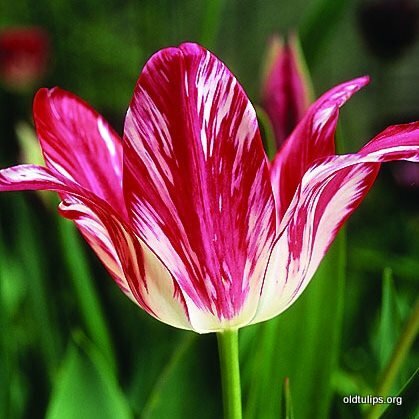 The best roze tulip; 18 inches; May 9, 18 days." -- Report, 1914-15 / Broken English Florists� Tulips. See also under Breeder Tulips. Argyre, ?? (Byb) broken and breeder. See also under Breeder Tulips. 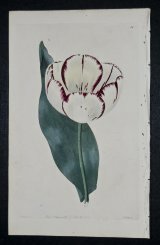 Bessie, 1847 (WNE) <1847 (HB) (RL) Broken English Florists� Tulip. Bybloemen. (Bred by Hepworth.) "Both Broken (flame, not now a feather) and Breeder." -- WNE. "Early, dwarf. Fair cup, but easily opens flat; deep purple markings, often rather characterless, on white ground. Fair constitution, but does not increase freely. Valuable for exhibition only in the feathered state. An attractive garden flower; 18 inches; May 8, 17 days." -- Report, 1914-15 / Broken English Florists� Tulips. Image Index: Tulip Gallery. See also under Breeder Tulips. Black and White, ?? (Byb) (HB) Image Index: Tulip Gallery. Butterfly. See: Papillon. Note: Hortus Bulborum prefers the name 'Papillon' for this tulip although it is described by "Report, 1914-15" under the name 'Butterfly'. Columbine, 1920 (Byb) broken (feather and flame) and breeder (WNE) 1929 (RL) "Flower Heliotrope on a white ground; 18 inches (50 cm)" -- TG. Image Index: Tulip Gallery. See also under Breeder Tulips. Cyclops. See: Goldfinder. 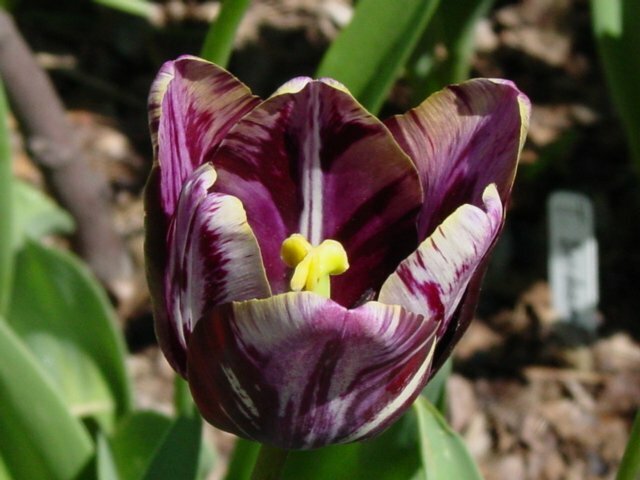 Note: Hortus Bulborum lists this tulip under the name ;Goldfinder; while "Report, 1913-15" lists it under ;Cyclops;. Dr. Hardy, 1862 (WNE) Broken English Florists� Tulip. Bizarre. (Bred by Storer.) "Broken only (flame." --WNE. "Beautifully marked with warm red-brown on brilliant golden-yellow ground; fine constitution, increases freely. One of the three best Bizarres, stands well under ordinary garden cultivation; 23 inches; May 10, 15 inches." -- Report, 1914-15 / Broken English Florists� Tulips. George Hayward, c 1852 (WNE) 1830 (HB) (RL) Broken English Florists� Tulip. Bizarre. (Bred by Lawrence.) "Broken only ('poor breaks')." -- WNE. "Tall; large cup of good shape and substance, though the petals are narrow and open too widely in heat. Rich red-brown markings on a brilliant golden-yellow ground, sometimes very fine. Good constitution; grows and increases well; 25 inches; May 8, 17 days." -- Report, 1914-15 / Broken English Florists� Tulips. Gleam, about 1930 (Biz) broken (feather) and breeder (WNE) See also under Breeder Tulips. Gloria, ?? (Rose) broken (feather) and breeder (WNE) (HB) See also under Breeder Tulips. Gloria Nigrorum, <1837 (HB) (RL) Broken Dutch Florists� Tulip. Bybloemen. "Cup-shaped, square shouldered; ground faintly yellow; flamed violet-carmine; base and filaments whitish; 27 inches; May 8, 17 days." -- Report, 1914-15 / Broken Dutch Florists� Tulips. Goldfinder, late 19th cent. (WNE) (syn. : Cyclops.) Broken Cottage Tulip. Bizarre. "Both Broken (not show quality) and Breeder." -- WNE. "Flower small; form and substance fair; out- side carmine, inside scarlet; base yellowish; 23 inches; May 6, 18 days." -- Report, 1914-15 / Broken Cottage Tulips. Note: Hortus Bulborum lists this tulip under the name Goldfinder while Report, 1913-15 lists it under Cyclops. See also under Breeder Tulips. Gretchen. "Byblomen Rembrandt. Flower pomegranate-purple, heavily feathered; base white. The broken form of the Darwin tulip 'Margaret ' (VII. r); 23 inches; May 7, 17 days." -- Report, 1914-15 / Rembrandt Tulips. See also: Margaret under Darwin Tulips. Helen Josephine, ?? (Rose) does not break well and breeder (WNE) See also under Breeder Tulips. James Wild, 1890 (Biz) broken (feather and flame) and breeder (WNE) 1939 (RL) See also under Breeder Tulips. Jane L. Eyre, about 1970 (Byb) broken (shown as a flame) and breeder (WNE) (RL) See also under Breeder Tulips. Jessie, ?? (Rose) broken (flame) and breeder (WNE) See also under Breeder Tulips. Juliet (Juliette), about 1845 (Rose) broken (poor flame) and breeder (WNE) 1850 (RL) See also under Breeder Tulips. Lord Frederick Cavendish, about 1870 (WNE) Broken English Florists� Tulip. Bizarre (Bred by Hardwick.) "Broken only (feather." -- WNE. "Tall, long flower, outer segments pointed; well feathered with red-brown on a good yellow ground. ' Attraction ' either the same flower or a related seedling." -- Report, 1914-15 / Broken English Florists� Tulips. Lord Stanley, about 1860 (WNE) <1915 (HB) (RL) Broken English Florists� Tulip. Bizarre. (Bred by Storer.) "Both Broken (feather and flame) and Breeder." --WNE. "Early, tall. Very good cup, but small; marked finely with rich brown on a good yellow ground. Good constitution and increases freely; 24 inches; May 12, 13 days." -- Report, 1914-15 / Broken English Florists� Tulips. Image Index: Tulip Gallery. Mabel, 1856 (WNE) <1915 (HB) (RL) Broken English Florists� Tulip. Rose. (Bred by Martin.) "Both Broken (feather and flame) and Breeder." -- WNE. "Rather taller than 'Annie McGregor'. Strongly marked with deep rose on a clear white ground, finely flamed and sometimes feathered; 22 inches; May 6, 19 days." -- Report, 1914-15 / Broken English Florists� Tulips. Mrs. Farr. "Rose Rembrandt. Flower deep rose-red; base suffused blue. The broken form of 'Farncombe Sanders' (VII. b)." -- Report, 1914-15 / Rembrandt Tulips. See also: Farncombe Sanders under Darwin Tulips. N. H. Eyre, about 1970 (Byb) broken (rarely shown) and breeder (WNE) See also under Breeder Tulips. Papillon, ?? (syn. : Butterfly.) (HB) "Rembrandt (Broken Darwin) Tulip. Bybloemen . Flower red-purple. Rosy lilac, flamed reddish purple; base blue; 27 inches; May 8, 16 days." -- Report, 1914-15 / Rembrandt (Broken Darwin) Tulips. Note: Hortus Bulborum lists this tulip under 'Papillon', while "Report, 1914-15" lists it under 'Butterfly'. Image Index: Tulip Gallery no. 1 | Tulip Gallery no. 2. Queen Alexandria, ?? (HB) See also under Breeder Tulips. Sam (Samuel) Barlow, 1860 (WNE) 1917 (RL) Broken English Florists� Tulip. Bizarre. (Bred by Storer.) "Both Broken (feather and flame) and Breede." -- WNE. "Flamed with rich reddish-brown on a bright yellow ground. There are two strains, one lightly marked and showing a good deal of ground, the other richly pencilled and redder. Vigorous; increases rapidly. One of the very best; 20 inches; May 8, 17 days." -- Report, 1914-15 / Broken English Florists� Tulips. See also under Breeder Tulips. Sarah Akers, about 1985 (Rose) never broken and breeder (WNE) See also under Breeder Tulips. Saskia, 1958 "Flower pink, white orange." -- TG. Image Index: Tulip Gallery. Silver Standard, 1760 (Rose) (HB) (RL) See under Single Early Tulips. Sir Joseph Paxton, 1845 (WNE) 1840 (HB) (RL) Broken English Florists� Tulip. Bizarre. (Bred by Willison.) "Broken only (feather and flame." -- WNE. "Beautifully marked with black and brown on a clear yellow ground; good shape and stands well; vigorous grower; 24 inches; May 8, 18 days. The best English tulip. A chance seedling from 'Trafalgar'." -- Report, 1914-15 / Broken English Florists� Tulips. Spaendonck, <1893 (Byb) (HB) See under Single Early Tulips. Sulphur, 1860 (Biz) broken ?? and breeder (WNE) See also under Breeder Tulips. Talisman, about 1860 (WNE) <1860 (HB) Broken English Florists� Tulip. Bybloemen. (Bred by Hardy.) "Both Broken (feather and flame) and Breeder." -- WNE. "Tall, beautifully marked with purple black on a fine white ground, bold black anthers. Good constitution and increases freely; 24 inches; May 10, 15 days." -- Report, 1914-15 / Broken English Florists� Tulips. See also under Breeder Tulips. The Lizard, 1903 (Byb) (HB) Broken Dutch Florists� Tulip. Bizarre. "Tricolor; 24 inches; May 15, 15 days." -- Report, 1914-15 / Broken Dutch Florists� Tulips. Zomerschoon, 1620 (HB) Broken Cottage Tulip. Rose. "Finely marked salmon-rose on cream, inside clear salmon when young; base yellow; 26 inches; May 15, 15 days. A very beautiful old variety." -- Report, 1914-15 / Broken Cottage Tulips.